Hello, I’m Steve and yes I am one of the blokes pictured on www.FightYourselfFit.com. Corney is a long time friend of mine and I’ve been lucky enough to be able to train with him regularly since 2008. 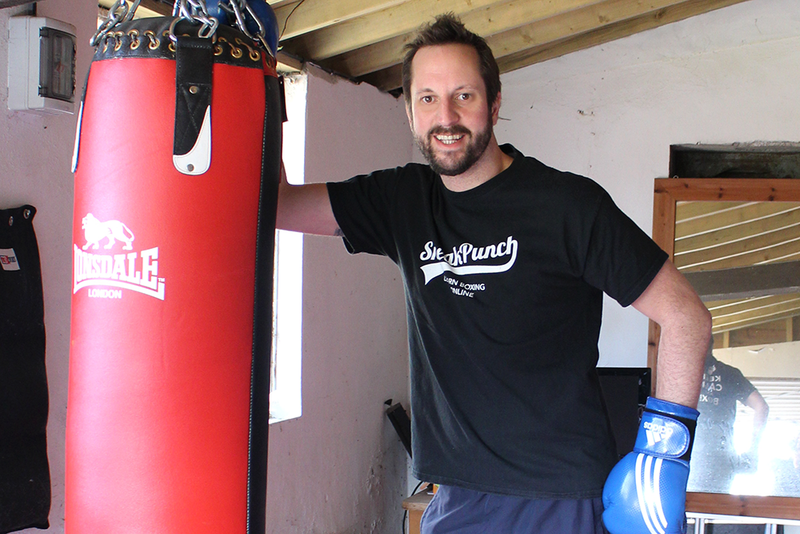 A few years ago myself, Corney and John (a keen amateur photographer and close friend of mine) decided we should put all our skills together and we founded SneakPunch.com. We produced online boxing tutorials and published written material via our website. In total our ‘How to Box’ videos now have over 600,000 views on youtube! It had been a great experience so far, but we knew we wanted to move forwards and try something a bit different. Still focusing on the boxing, but with a different twist. And so the concept of Fighting Yourself Fit was born. We wanted to make punchbag workouts accessible for everyone, not just those like me who are lucky enough to have a former World Champion Boxer as a friend. I had always wanted to box, but had never managed it. I’d spent many years studying Wing Chun and enjoying being an instructor in the latter years. I’ve loved all things fighting for as long as I can remember and I’ve trained in several other martial arts including, Karate, Thai Boxing and Filipino stick fighting. I really enjoyed learning all of these skills, but still felt something was missing. I wasn’t satisfied. I still wanted to box, but I just didn’t know where to start. I really felt that doing some boxing training and getting in the ring would add the skills I needed – to my fight locker, as such. To be honest I also quite liked the idea of being hit, which I admit does sound a bit weird, but there you go. And yes before you ask, I am that man who has bought all manner of punch bags, sizes, materials galore and usually have at least one gathering dust in the garage. I began this obsession around the age of 14 and for the most part of my life I still never really figured out what to do with it. On the occasion that I would visit the garage for “DIY purposes” I would pick up what I needed, and then hit the bag at least once on the way out – a gesture of my ever present manliness of course. Sadly that was about as much use as my bags got over those years. Luckily for me – from both a personal and fitness point of view – I was introduced to Corney by a mutual friend back in 2008. As well as becoming a great friend, Corney also became my trainer. I loved nothing more than rising at 6am to train with Corney. It was the best way to start my day. Corney’s sessions were tough, but I loved them and pretty soon I had recruited a few likeminded individuals to share the mayhem. You find out who your real mates are when they don’t object to a punch in the face before breakfast. We loved it. In recent years Corney and I often talked about how it would be great if we could bring these kinds of training sessions to more people – if there could be some way to bring boxing training into peoples’ homes. It soon became clear that the humble punchbag could make this a reality. This often neglected piece of equipment could be a key tool for getting fit and learning to box. 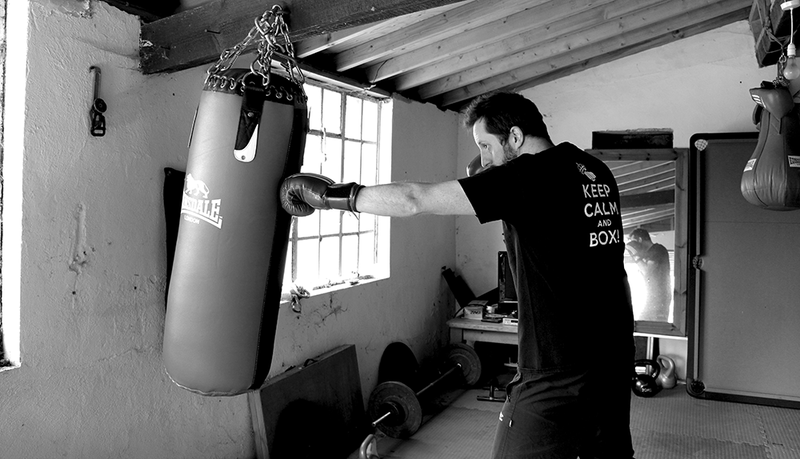 We already knew how seriously tough punching the bag was – we just needed to develop the programme so others could learn as they worked on the bag. Boxing is one of the toughest sports and nothing is harder than a heavy bag session. Fight Yourself Fit was born. After months of trialling our very own FYF workouts, I was getting amazing results from the workouts we’d developed. As well as feeling super fit I was thrilled that we were going to be able to bring these workouts to others. Now all that remained was to film and edit our work and bring it to life. Unfortunately this meant I was resigned to spending the next few months of my life in front of my Mac, editing by day and by night – leaving very little time for any kind of a normality, let alone my usual training regime. Still I didn’t want to waste any of it. I wanted to challenge myself to fight myself fit again, to prove just how good our system is and that I can do it again. So… in the name of science I banned myself from any exercise (this was pretty simple with all my time editing) and also managed (violins out please) to eat everything and anything I could find during the past few months. Sounds good eh… but although the idea of eating all that junk food might appeal, it’s actually been really hard. Not the eating and drinking, that part was relatively painless, in fact it was worryingly easy – my stomach quite happily grew to accommodate all this new food. I found myself snacking between snacks, my alcohol intake went up and after a few beers I was even hungrier still. What’s been hard, is dragging around over a stone more weight, breathing heavy just walking up the drive or playing football with the kids. Also dealing with the overwhelming feeling of doom and gloom that has invaded my consciousness. Even though I was doing what I love in terms of work I still felt low. I hadn’t considered what a big part exercise had played in my life in terms of keeping me happy and motivated. These were aspects of myself that I thought were just me, who I am. I never considered how my energy actually related to my exercise. I also realised just how easy it is to over-eat when not exercising – I found that my mind just wasn’t in the right place. There seemed no point to saying no. Before all this, I now realise that by exercising I felt healthier and more decisive, more in control and so was easily able to just say “no” without another thought. Without exercise in my life, I found myself having thoughts like ‘why not” “have another” I’m fat already, “carry on” “eat it all”. I knew what I was doing, and that I had chosen this path on purpose, but even so it was hard. I’m just so glad I was able to remind myself that I would soon be free to start shedding it all and start again. I was to have a fresh start very soon. Why not follow me or the others on this site as we fight ourselves fit – better still why not join in and fight yourself fit with us!